The best way to extend your wireless network is to use an access point. An access point is like a router but exists only to provide the wireless network, using the router for internet access. The advantages of using access points are the superior coverage and performance. Unfortunately, to use an access point effectively, you need to connect the router and the access point using network cables, which can be a problem if the house does not already have cable drops. A range extender is an access point that extends the existing wireless network. 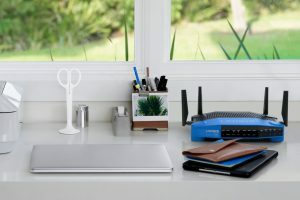 Instead of connecting to the router with a physical network cable, the extenders connect to the wireless network and broadcasts the same signal. The advantage of this approach is that setup is easy and quick. The downside is a drop in performance for each extension. For example, every time you extend the network, the wireless bandwidth drops by half. Another downside is compatibility. Often, you can only extend the network if the router and the extender are from the same manufacturer. Another option is to use Powerline adapters to extend the network through the electrical wiring. You can then take the network output from the adapter and use them for the access points. Using these two methods will provide superior performance and cost-effectiveness.